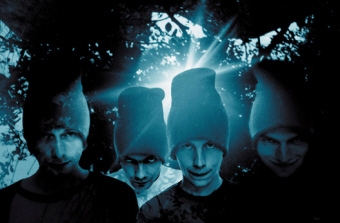 Sigur Ros are an Icelandic four-piece, formed in Reykjavik in 1994. The band consists of Jón Þór (Jónsi) Birgisson (vocals, guitars), Kjartan Sveinsson (keyboards), Orri Páll Dýrason (drums) and Georg Hólm (bass). Their debut album 'Von' was released in 1997. A remix of the same album which followed a year later was entitled 'Von brigði' The band's second album proper 'Ágætis byrjun' was released in Iceland last year to massive critical acclaim. It has spent (wait for it) over 50 weeks at the top of the Icelandic charts and has won numerous awards in the country. The band are now focusing their sights beyond their homeland. They signed to Fat Cat in the UK and managed to attract much interest from both press and public with the recent release of two EPs. The release of their album 'Ágætis byrjun' on Fat Cat has been eagerly anticipated and it is finally available to buy in the shops. My first introduction to the music of Sigur Ros was at their sold out gig in the Temple Bar Music Centre last week (August 22nd, 2000). Having heard neither the Ep's nor the album beforehand, I decided to believe the hype and check out the band. A fine decision this proved to be. Sigur Ros performed an incredibly beautiful set. Enchanting from the first note until the last, their music is intense and captivating in the extreme. It was difficult to comprehend how a four piece could make such gorgeous music. The instruments the band use are simple enough - keyboards, flute, accordion, bass, drums and guitars. It is the approach they take to playing them that makes their music so interesting. The guitar is played with a cello bow and this, combined with layer upon layer of sound, makes unique music which draws the listener in. Their singer Jonsi adds to the soundscape. He has a haunting, fluid voice - at times it sounds almost choral. The words are sung in a mixture of Icelandic and Hopelandic (a language of Jonsi's own creation) and his voice lilts and flows with the music. At times on stage Jonsi recalls Radiohead's Thom Yorke, but only because of his intense on-stage presence. Incense and candles added to the atmosphere of what was a very special concert. My only complaint was that it was far too short. The band left the stage after about an hour without an encore, returning only to bow to their audience - and well they might. A listen to the band's album 'Ágætis byrjun', reveals the same beautiful music and intensity of sound as was evident in the live set. At times their music is soothing on the ears and mind, all lush harmonies and orchestration. At others it threatens the safety of your eardrums, exploding into clashing drums and psychotic rhythms. If musical reference points are necessary, I would chance a guess that Sigur Ros come from similar schools of musical thought as acts such as Mogwai and Spiritualised. One of the highlights of the album is 'Svefn - G - Englar' (Sleepwalkers), with its ghostly refrain of 'Tju Tju' which lingers in the mind. 'Ný batterí' (New Battery) is another highlight, as is 'Olsen Olsen'. Really though, the whole album is an experience which is difficult to translate to words. The meaning of the album title is 'A good start' and for this band it most certainly is. 'Ágætis byrjun' is - to my ears at any rate - one of the best releases this year. Sigur Ros are a band that I think we will hear a lot more from in the near future. They are currently on tour in Europe, and will be playing with Radiohead on their September dates. Catch them while you can. Pure magic. Ágætis byrjun is out now on Fat Cat. Visit www.sigur-ros.com for more information on the band.